Adam McKay’s The Big Short is easily one of the most important films of the last year, if not the last decade. It very rare you find a film that is relevant to everyone, but The Big Short is just that film. This is hard for any film to pull off, much less one that deals with such complex issues as Wall Street reform and real estate financing. Yet, thanks to an all-star cast, the material never feels too heavy handed and remains engaging through its entire running time. This film is going to hit home for a lot of people. Think back, do you know of anyone not affected by the economic collapse of 2007? I didn’t think so. The story follows three separate threads attacking the story from multiple angles. This allows the viewer to not only get the complete story but see the cause and effect of the fallout on a much larger scale. It begins with the eccentric Dr. Michael Burry (Christian Bale) who takes it upon himself to study thousands of individual loans bundled together into highly rated mortgage bonds. Naturally anti-social, Burry doesn’t know people but he does know numbers, which leads him to the conclusion that the economy is about to collapse in an unprecedented way. Not one person believes him so he is laughed all the way through Wall Street as he goes about betting against the economy. 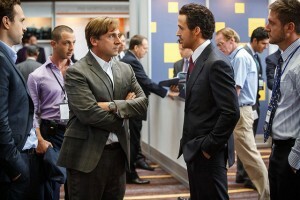 Steve Carell and Ryan Gosling lead an all-star cast in The Big Short. What he does next sets off a chain of events that unknowingly brings in young Wall Street banker Jared Vennett (Ryan Gosling), 20-something money managers Jamie Shipley (Finn Wittrock) and Charlie Geller (John Magaro) and hot-tempered hedge fund manager Mark Baum (Steve Carell playing beautifully against type). Though the paths sometimes cross each of their threads unveils something new about the state of the real estate market and Wall Street in general all of which is both shocking and true. Stylistically McKay decided to go balls to the wall and make the story as exciting as he could. Whenever things get too complex a character will break the fourth wall and either explain to you what they have been talking about or bring in a pop culture icon to spell it out. This includes some genius scenes of Anthony Bourdain comparing his fish stew to the real estate market and Selena Gomez demonstrating mob mentality as it relates to investments. This may sound strange but it not only totally works but elevates the film. In the end, The Big Short works as a rebuttal of sorts to The Wolf of Wall Street. If Wolf glorified the excess of the banking business it is The Big Short that brings it crashing back down to reality. Brad Pitt, who plays the mentor of the young managers, has a fantastic speech that gets to the heart of what it means to be in the financial industry. The whole movie is filled with those small but powerful moments that can be very moving. It will be very surprising if The Big Short doesn’t win any major awards. No matter what happens expect the film to quickly enter the ranks of cult notoriety. The Big Short opens everywhere Dec. 11, 2015.